Clinching the Debate: Is Hugging Political Candidates Unethical? All is fair in love, war and politics. But do they mix? Critics say Rachel Maddow, MSNBC television host and political commentator, crossed a line when she hugged Democratic presidential contenders Bernie Sanders and Hillary Clinton after a televised debate. Rachel Maddow hugs Hillary Clinton and Bernie Sanders. 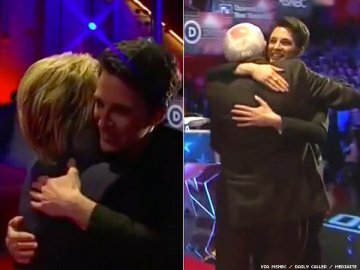 Maddow says she’s a hugger, and probably will hug again if invited to host another debate regardless of political party. Kurtz acknowledges that Maddow is a smart lady, a Rhodes scholar with deep knowledge of the issues. But as Kurtz sees it, the hugs restrict MSNBC’s efforts to shed its left-wing label and rebrand itself as a news network. Washington Post media critic Erik Wemple shrugs it off. “Consider the hugs through the prism of journalism ethics,” writes Wemple. “Were they transparent? Yes, there’s a video of the hugs, which took place in front of the cameras; any clandestine backstage moderator-candidate hugging is strictly forbidden. Were they even-handed? Yes, both Sanders and Clinton received hugs of very comparable warmth, duration and hand-pats. Were they prejudicial? Nah, coming at the end of the event, it’s hard to say that the affection received by Maddow influenced the questions, which were solid. Those tenets apply to this case, which is why some journalists might do a double-take at Maddow’s embrace. In a later blog post, Wemple returns to the debate-ending squeeze. “The industry’s orthodoxy dictates that those with opinions shouldn’t be running such straight-news events. Count me out of that strain of hollow thought. We’ll take Maddow over some ‘objective’ drone every time,” he writes. Which is to say journalism standards and customs change over time. Lines are drawn and redrawn. And journalists will agree or disagree. It’s the nature of ethics. “You must remember this, a kiss is just a kiss, a sigh is just a sigh. The fundamental things apply as time goes by.” Nothing there about hugs. In your view, was Maddow wrong? Leave a reply below. Professional journalists with ethics questions may contact us at ethicsadvicelineforjournalists.org.